Cellucor NO3 Chrome Review – Is it effective? As a supplement user, I am quite used to distributors trying to overstate the effectiveness of their product. Therefore, I take three things into consideration when evaluating supplements: brand reputation, ingredient composition, and user reviews. In this review, I have taken these three things into consideration as I evaluate the effectiveness of Cellucor’s Nitric Oxide booster product, NO3 Chrome. Cellucor is no stranger to the supplement community. It’s one of the most recognizable brands in the business, and their products have had their own fair share of success. Cellucor is the brand responsible for products like C4, Super HD, and Alpha Amino. If it’s we are to base our assessment based on brand reputation, Cellucor’s products would be among the best supplements for muscle gain. 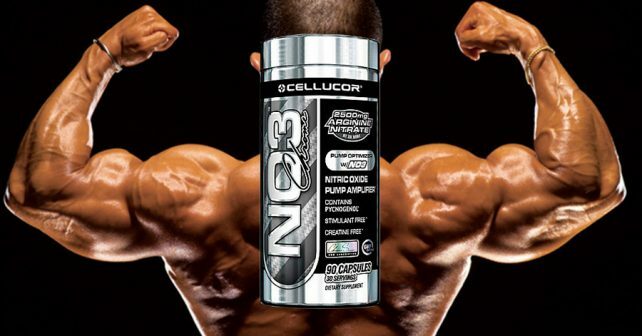 However, there is more to a product than just the brand, and we’re set to dig deep into Cellucor’s NO3 Chrome product specifics to know more about the product. NO3 Chrome is a vasodilator product created for the sole purpose of improving the blood flow to the muscle. NO3 uses vasodilator ingredients to increase Nitric Oxide levels in the body to dilate blood vessels and promote more blood flow to the muscle, thus increasing the “pump” or the tight sensation in your muscles resulting from blood rushing to the muscle. The pump is also what makes muscles appear bigger and fuller after a workout. Nitric oxide boosters like NO3 Chrome are used by both recreational athletes and bodybuilders for its effect on muscle appearance after exercise. NO3 Chrome markets itself as a creatine and stimulant-free supplement that can increase pump after exercise. The most important ingredient listed in NO3 Chrome’s supplement profile is Arginine Nitrate, which is a combination of the semi-essential amino acid L-Arginine, and Nitrates which supposedly work together to increase nitric oxide levels in the body. The mixture also contains Citrulline Malate which is a form of Citrulline, a precursor of L-Arginine to increase nitric oxide levels in the body. While it’s important to have nitric oxide boosters, it’s important to note that there are no claims that the mixture improves overall muscle strength and recovery, which are two of the most important goals that supplementation aims to achieve. It’s also important to note that the serving size is 3 capsules, which gives you only a month’s worth of servings per 90-capsule bottle. That’s just over a dollar per day spet on the supplement alone. Cellucor is one of the best brands in the supplement market, but that doesn’t mean that all of their products represent the best muscle building supplements in the business. You can save money buying more effective products at much cheaper prices. My go-to nitric oxide booster is NitroGenix 365, which isn’t as expensive as NO3 Chrome, but is much more effective by far. If you’re looking for the best supplements for muscle gain, look no further. Take NitroGenix 365.